Hi-Rez Studios is one of those “follow the trend” developers, one that doesn’t seem to have an explicit purpose like Treyarch (first person shooters), Obsidian Entertainment (role playing games), or Sergey Titov (shovelware). Instead, the company’s development history can be summed up as whatever seems to be most popular at the time, with its first two ventures turning out to be financial sinkers. With the success of Smite on PC and Xbox One, it was likely guaranteed that Hi-Rez’s next product would be something along those same lines. Introduce Paladins. I like to think of Paladins as the love child of Team Fortress 2, Smite, and Hearthstone. The game is a Frankenstein’s monster mash of first person shooting, MOBA objectives, with a splash of collectible card game customization that keeps people awake (and spending money) on Hearthstone. First, the SMITE part. 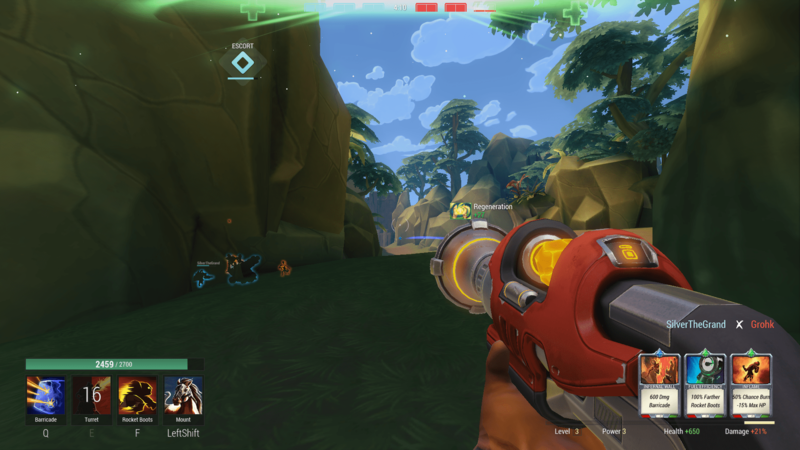 The meat of Paladins plays out nearly exactly like its MOBA counterpart (at least in the one game mode currently available), with two teams of five players of unique class fighting for control of capture points. The team that captures said point spawns a siege weapon of incredible strength that lumbers towards the enemy base. With the help of the siege weapon, the team must knock down two layers of base defense before destroying the core itself and claiming victory. Once the siege weapon is destroyed, the timer restarts and a new point opens. Paladin’s characters are bound to be familiar to anyone with MOBA experience. You have the turret and shield-laying engineer-type, the bow-wielding ranger scout that can reveal hidden enemies, the healing paladin, the tank, etc. 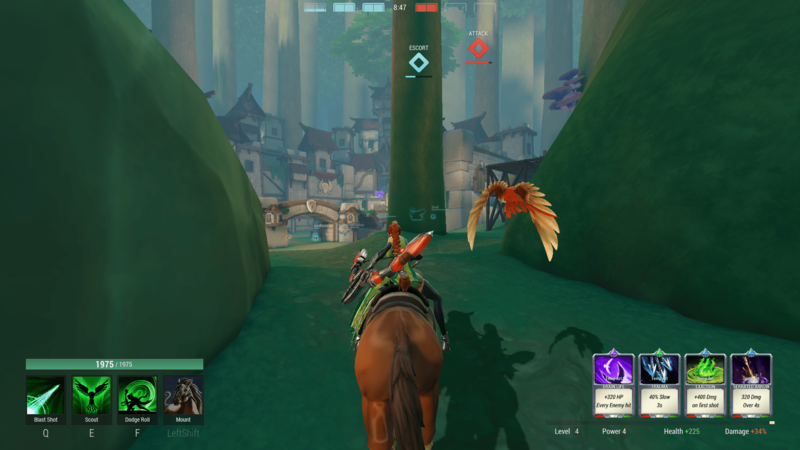 Each class has three powers plus a mount to allow for faster travel around the map, and even the maps themselves seem to be structured similar to the three-lane system present in MOBAs. But where Paladins is similar to SMITE, it is equally different. Like any other first person shooter, you have to aim your attacks. You won’t find trash mobs to grind money and experience on, in fact there is no money as the inventory and item shop didn’t make the roll over either. Rather, players can gain points through capturing objectives, dealing damage, and defeating enemies, in addition to a rolling experience that keeps poorer performing players from falling too far out of the loop. Finally, the level cap is 5, with much of the power difference coming from cards that become available as you level up. The Hearthstone level of customization is ultimately what sets Paladins worlds apart from MOBAs and other team-based first person shooters. In one match I was able to turn my archer into a mean green killing machine, not only capable of landing major hits that slowed down targets, but healed me at the same time. My engineer in another match was capable of a shield turret combo that healed me while the shield damaged anyone who dared to get too close. I also have to hand it to Hi-Rez for adding in a casual version of the game to even the playing field. The standard game mode doesn’t allow you to choose which cards you go into battle with, instead picking them randomly out of your inventory. It’s a nice idea to keep the game fair for everyone, rather than forcing newer players to go up against seasoned veterans with stacked decks, but the effect can be frustrating. While the game is still being heavily balanced, the game mode does make it possible to go into battle with none of your useful cards. The more you play Paladins, the more you unlock cards, and the more tinkering you can do with each individual character. I heavily enjoyed my time playing in the beta so far, and look forward to the new characters and game modes that will be coming out in the coming months. As with previous Hi-Rez games, you can nab a beta key by buying a founder’s pack ($20), by registering for the beta, or by begging someone in the community for one of their extra invitations.